12×25 DPS. How low can you get? 12 x 25 DPS. Pull hard, see how low you can go. I think this coach has good intentions in helping the swimmer find a long stroke. But the main thrust of the set is to see how low you can get, with little guidance of how to do so aside from pulling hard, gliding for 5 seconds and using a pull bouy. Again, I htink the intentions are good…encouraging a horizontal body position (Balance), but this set uses an aid to do so…how well do you think that will translate when the swimmer goes back to full stroke? Another recommnedation…”Pull Hard”. This somewhat defeats the initial purpsoe of trying to reduce stroke count…low count is reflective if reduced DRAG, not incraesed POWER. The best way to start thinking about DPS is not “how low can you go”, but rather, “How efficiently can I swim?” Can I keep my usual swimming effort and still drop a stroke or tow by focusing on active elements of my swim & body position to eliminate drag? 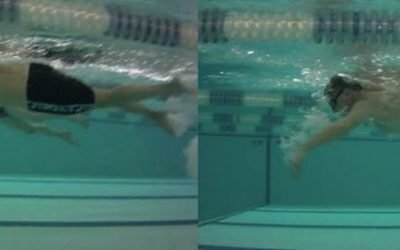 (rather than adding power)… If you can re-orient the intention then better swim habits and body position will be incorprated into all aspects of this swimmers form, not just when drilling, or doing a set with a pull bouy. And once you can drop a stroke or two after a warmup focused on body position, why not see if you can sustain that form? 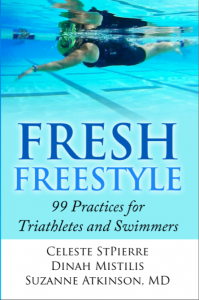 after all, that’s why we practice drills…to take over something into whole stroke freestyle. Here is a slightly more enlighted version of the above swim set. 4 x 25 Easy, effortless strokes, count SPL. 4 x 25 as follows (Fist only, 2 fingers, 3 fingers, palm). Keep effort light. How does stroke count change wiht each length? 4 x 25 + 3 x 50 + 2 x 75 + 1 x 100 Hold your “N” for each length. If SPL climbs to N+2 or more, first try to focus on good posture & spearing targets to reduce back to N. If you still cannot achieve “N” to “N+1” then rest longer and repeat that length. If unsucessful, go back down the ladder. If successful to 100 yds/m at “N” to N+1, repeat 100s with rest until you can no longer hold it. Note how many in a row you were able to do. 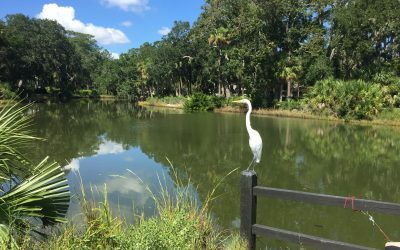 Triathlon Swimming Technique – When to Catch the Water? Did this today – I’ve tried this type of “exercise” before but found that I tried hard to get a lower count, as you mentioned. Today, I actually got a lower stroke count for me and with a very easy effort, and was able to maintain it for quite a while! I am excited! Anxious to see what you have to say about using the tempo trainer to get faster!! Thanks Liz, happy it’s working out well for you! What’s your height and what is your current SPL? here is a post I just published by fellow coach Dinah Mistilis of Discovery Aquatics about making sure SPL doesn’t get “too low”. Enjoy!